Can you spot the common theme here? 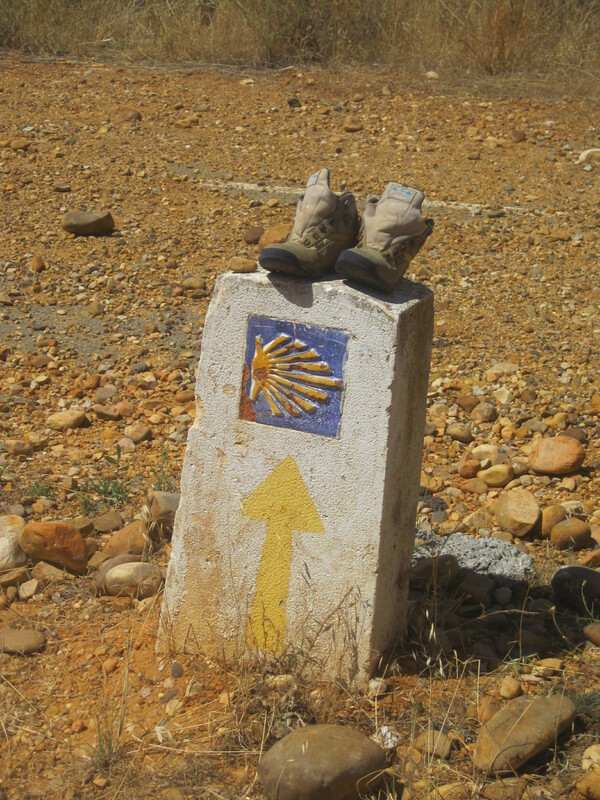 No… it’s not the Camino de Santiago. Well, alright, it kind of is… but you we’re supposed to yell out “It’s the stones!” (yes… even if you are at work). There are piles of stones on virtually every single Camino marker along the path… which is pretty impressive considering the route is 800 kilometers long. To explain the presence of the stones I’ll take a step back first, and mention what several multiple-time caminoers and long-time hospitaleros (the folks who run the pilgrim hostels) told me… that the Camino is simply a metaphor for life itself… cheesy yes, but true (I found) in the sense that the Camino, as with life, is not really about the destination… it’s about the journey. So, back to the stones… the guidebook version of the explanation will tell you that the stones represent a personal burden, and by placing the stone on top of a Camino marker one is symbolically leaving that burden behind. Insert the word sins for burdens in the sentence above and you’ll understand how medieval Christian pilgrims viewed the tradition and why it began (and, likely, how modern Christian pilgrims still view the act). If one adopts the metaphor of viewing the Camino as life, then the act of leaving something behind (as in letting go of certain grudges, negative feelings, limiting factors or behaviors, grief, etc.) can actually be a pretty powerful statement/action when seen from that perspective. And, as with life, it all really depends on the sincerity of the action if it’s going to actually make a difference or not. Some people have a decidedly less spiritual reason for leaving certain things behind. 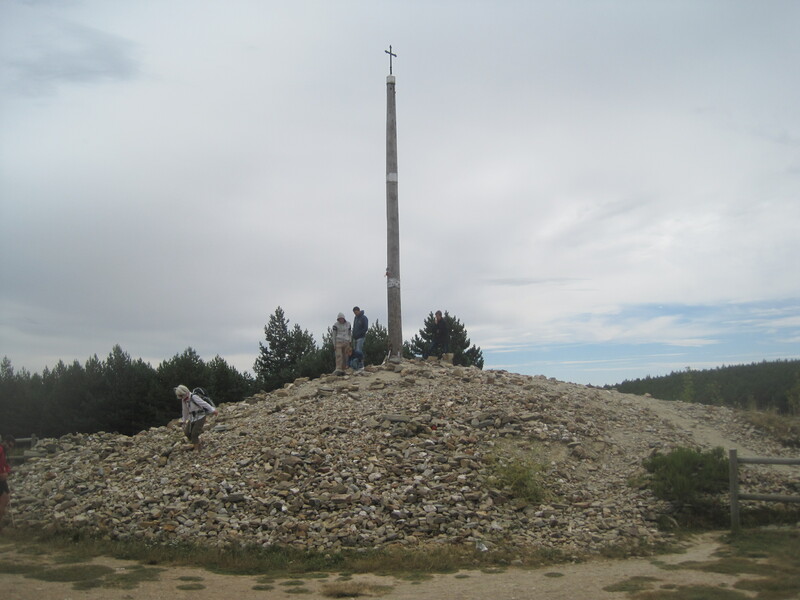 The act of leaving something behind manifests itself most prominently at the Cruz de Ferro (Iron Cross), which is on top of Mt. 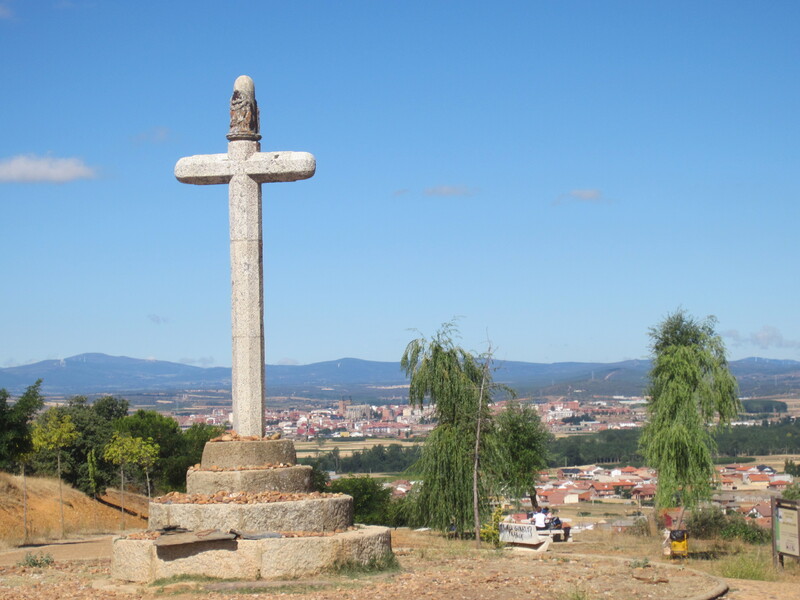 Irago, between Astorga and Ponferrada… and I mean most prominently because there’s a huge pile of stones at the base of the cross (the iron cross itself is actually pretty small… but it’s been placed up on top of a rather long pole) You’re supposed to bring a stone from home and leave it here (many people leave personal objects and messages as well)… but since I did the Camino more in an ad hoc fashion I just picked one up on the way (and kept all my thoughts internal). Here’s a shot of the cross from a bit away so you can see how big the pile of stones actually is. One thing I actually found quite funny about the Cruz de Ferro was that it was built up by fellow pilgrims (and the guidebooks) to be this wonderful spiritual monument and symbolic moment… which it actually is (yes, really)… but at the same time there’s a parking lot and picnic table right next to it so families are picnicking and people are drinking beer and climbing all over the pile of stones. It actually made for some very funny images in contrast where people kneeling in prayer having, or attempting to have, a moment of quiet solitude would literally be right next to families trying to corral their kids and elders together for a photo. I stifled several chortles internally (you know… to keep up the decorum of the scene as best I could). Ahh people… you never cease to entertain me. 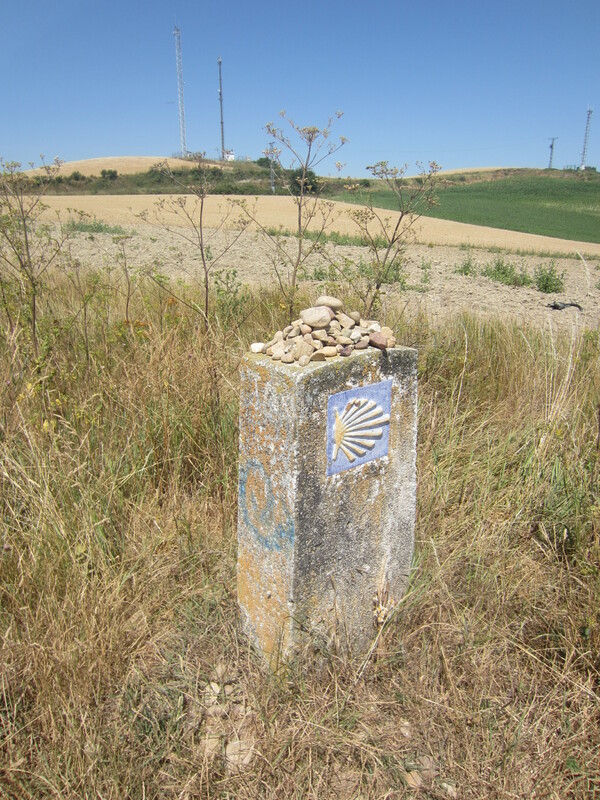 Regarding the stones on monuments practice, one thing I did notice was that the ubiquity of stones on top of the Camino markers seemed to die out once I reached Galicia (Galicia being the final stage of the Camino Frances and the state where Santiago is located). 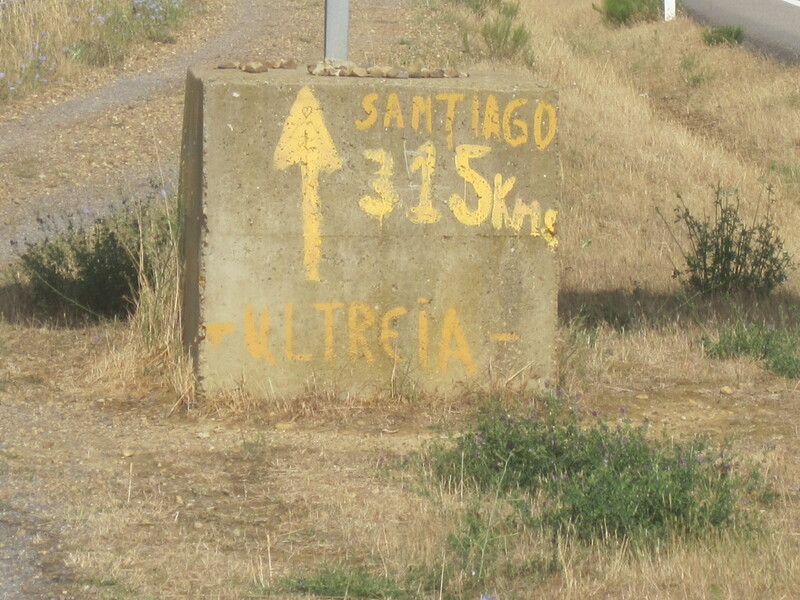 Just speculating here, but it may have to do with the vast increase in the number of Camino markers as the state of Galicia has taken it upon itself to place distance markers every half a kilometer (the only place on the Camino where there are actual distance markers along the route). The only other reason I can think of is that in Galicia there’s a huge increase in the number of pilgrims just walking the last 100 kilometers (the bare minimum walking requirement from the cathedral in Santiago to get the Compostela certificate for completing the pilgrimage)… derisively referred to as touregrinos by the folks who have walked much farther… and these folks don’t really know, or care, about the stones tradition as they’re just walking for the certificate. Anyhow… speaking of people… I actually originally started walking the Camino thinking it would be this very solitary journey, and that I’d get to spend a lot of time alone with my thoughts and have all this personal reflection time… but the solitary journey idea was pretty far from the actual reality of what I found. Now I’m sure some of it has to do with the fact that summer is peak season in terms of the number of peregrinos undertaking the journey (and that if I would have done this in the winter it would be more like how I thought it was going to be… i.e. solitary), but there was actually quite a lot of people. And, given that one can only walk so many miles… wait… we’re in Europe… so many kilometers a day, you actually end up seeing the same people over and over again, some of whom you end up forming little “Camino families” with… where you all walk together, or at least spend time together eating and/or staying in the same albergues and towns. And when you walk with someone all day… you actually get to know them pretty well, especially as there’s none of, or fewer of, the general layers that we normally hide ourselves behind when meeting other people (social status markers, phone distractions, or just the general shield one puts up in front of others in real life) to get in the way, so you kind of get a direct line into another human being (if you choose to pursue it that is). 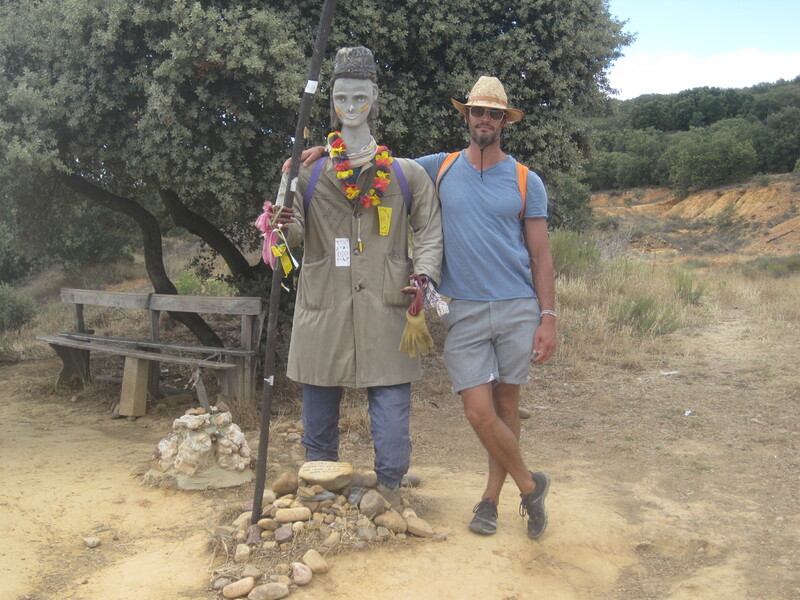 It’s a very refreshing feeling (to speak directly with another person as opposed to the facade of a person) and, for me at least, a feeling I will try to replicate, and reciprocate, when done with the Camino. 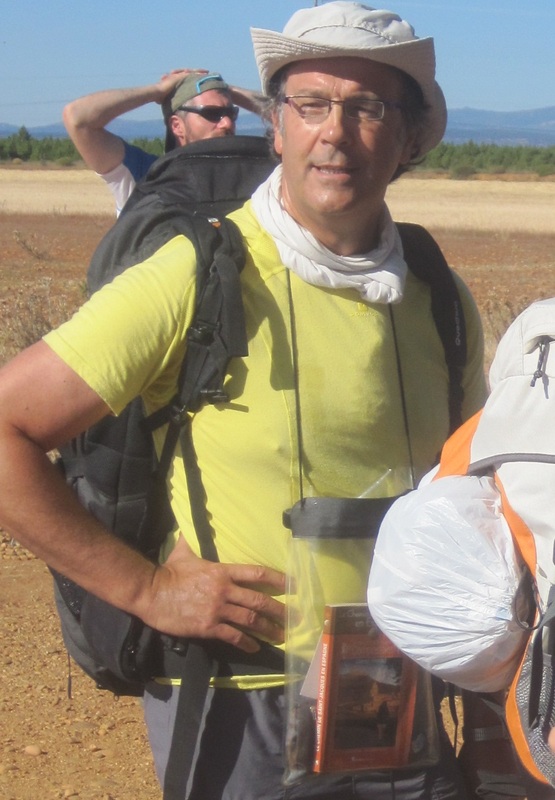 That’s not to say I formed deep bonds with everyone I met, but definitely a few select people… and I’ll leave it to all you arm chair (or real) psychologists out there to tell me why this happens (similar attitudes in the people who would undertake the Camino, the bonds formed by shared experience, etc.). Interestingly enough, for me, it was these deeper level connections with others that allowed for lots of deep personal reflection… because (maybe strangely) the (sometimes intense) time spent together with others actually made me think a lot about myself (via conversations, noticing how I interacted with others, how my mood affected my behavior, etc. )… so I at least experienced lots of deep personal reflection time (even if it wasn’t solitary). Anyhow… as you walk on, people fall behind, or go ahead, and some leave as they’re only walking for a week or 10 days, but I found it nice to keep bumping into the same people on a regular basis (in fact several people that I met in my first couple days reappeared about 3 weeks later near Santiago). I have no idea if they thought it was going to rain, or if they were going to have to ford a river or something, but the utility of such an item in no way made up for how stupid they looked. They were basically the equivalent of the downtown office workers who have their ID card hanging from their belt on one of those janitor extending key chain dealios… you know… cause it’s convenient (because it so difficult to occasionally get it out of one’s pocket after a starbucks run). Danke schon deutschland… danke schon for keeping me entertained during some long walks. Hmmm… the other stereotypes I noticed dovetailed very nicely with general cultural stereotypes everyone is familiar with. The Irish always seemed to be getting late starts. The Italians all managed to find each other by heading directly to every town plaza with an outdoor cafe where they would all speak loudly in Italian (gesticulating wildly of course) while enjoying coffees, pastries and cigarettes (I swear I did not see an Italian eating anything else). The few Americans I met had seen “The Way” last year, and were all trying to win the imaginary competition of being the best caminoer possible (lots of “I walked 35 kilometers today and 40 kilometers yesterday… how many did you walk?”). Interestingly enough I actually met very few Spanish peregrinos until the last 100 or so kilometers… but the Spanish townspeople I met all shared the same trait, despite having lived in Spain (where you’d think they’d get used to it by now) their entire lives, of being uniformly afraid of the afternoon sun (every time I’d leave a town in the afternoon, without fail, a local would stop me and let me know it was really hot and there wasn’t a lot of shade and that I should stay for a while and walk later). The Koreans would try and beat out the Germans for the I-can-wake-up-the-earliest award as well as the travel-in-medium-sized-groups-and-not-socialize-with-anyone-else award. I know we’re all supposed to know that stereotyping is bad, and individuals are always different than the collective and blah blah blah pc-ness, but when you see those stereotypes in action… it’s hard to dispute why they exist, and always very funny to see people behaving exactly as one would think they would behave based on their background. These are the dreaded touregrinos (tourist peregrinos) I mentioned above. 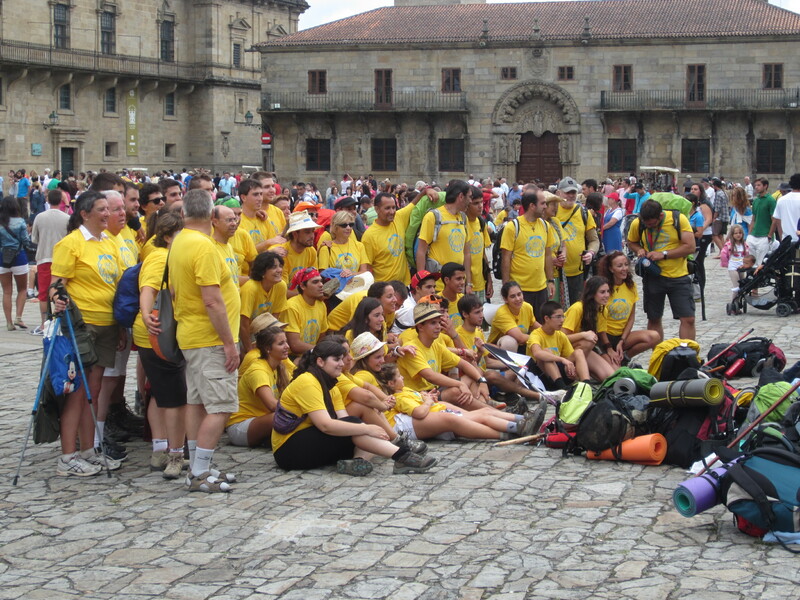 These folks are doing the last 100 kilometers or so of the route to Santiago just to get their Compostela. As a stereotype… they are generally Spanish or Italian (with some of everybody thrown in the mix), they have booked all their accommodation ahead of time… selling out every place in town (even during the height of summer I never had to book ahead anywhere for fear of not having a place to stay… just show up and something will be available… and even if it’s crowded the hospitaleros will go out of their way to try and find something for you…even if it’s a mattress) and they just pretty much ruin the whole feeling of Camino (yes, my opinion). I can actually pinpoint the second the Camino changed for me… it was cresting the hill into the town of O Cebreiro… the first town in Galicia. The whole feel of the Camino shifted just like that (insert finger snap)… suddenly the locals (who had been very friendly the whole way) became pretty hostile, the other peregrinos all stopped saying hello, everywhere we tried to stay was booked full and there were loads of very bright and shiny (and loud) new people everywhere. Suddenly, the Camino became full of other people while walking (I mostly walked in the afternoons to avoid most people because I didn’t mind the heat and everyone else did… and I enjoy sleeping in… so I rarely saw other peregrinos after 2 PM or so) and these people would be blasting music from their phones, or (the worst) simply singing crappy pop songs out loud as a group (I’m looking at you Italian women) or no one would say hello to each other… Que Terrible!… literally the whole mood just shifted to this heavily touristic beach town feel. My lovely companion and I decided to book ahead for the first time and literally sprinted the last 100 kilometers into Santiago just to avoid the touregrinos. I know this is a human nature thing and I’m behaving like the dude who used to listen to Green Day before they “sold out” and became big time… but I really can’t help it (Darn it… I am superior to the touregrinos). Despite making fun of the Germans above, I actually longed for their quiet marching in the morning hours. From O Cebreiro onwards I definitely adopted a let’s-just-get-this-over-with-attitude. Luckily, the end of the road (i.e. Santiago) is amazing (I’m actually writing this from Santiago) and more than made up for the last 100 kilometers. 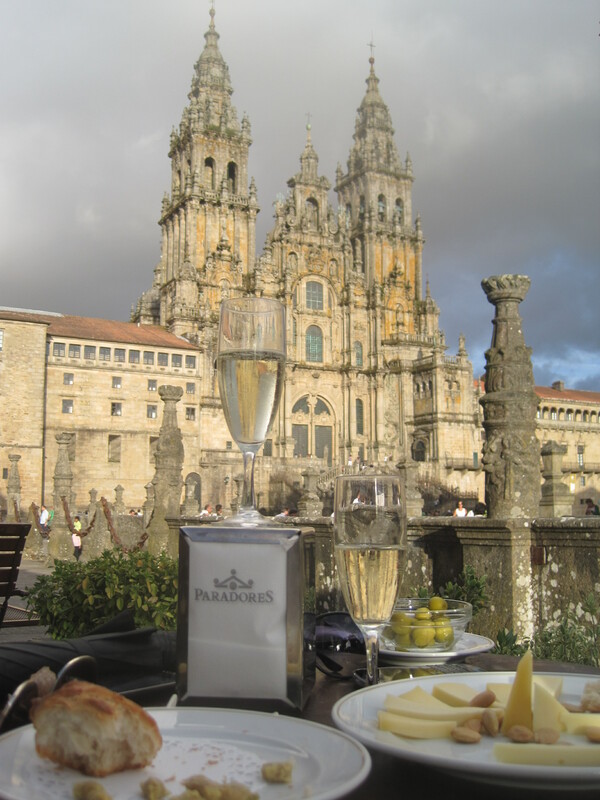 This entry was posted in Camino de Santiago, Spain and tagged camino de santiago, spain by Richard. Bookmark the permalink.